In cooking a variety of fish species. And one of them is coho. Some time ago about it almost forgot, the most popular kind salmon and trout, which actively began to breed in fish farms. However, the wonderful taste of tender meat coho salmon and its beneficial properties does not leave indifferent those who once tried this fish. Coho salmon belong to the Salmonidae family. Its features are a pronounced silver colour scales. Habitat this representative, salmon – Pacific. The range of its stay is very broad. This Kamchatka, Alaska and even the North island of Japan. The size of coho salmon is usually 75-85 cm and weight about 8-10 lbs, but there are species with the size of about one meter and weighing up to 15 kg. Coho is not as common and popular as trout or salmon, but comparable to them in taste and beneficial properties, and its meat also has a distinct pink color. In addition, unlike his colleagues, coho salmon do not grow in fish farms, and mined in the sea. 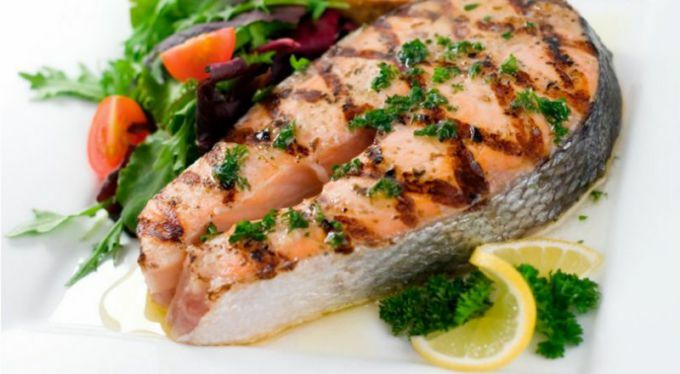 The representative of salmon contains polyunsaturated acids, such as omega 3, and a lot of minerals and trace elements. Silver salmon meat is rich in iron, potassium, magnesium, calcium, sodium, phosphorus, chlorine, chromium, molybdenum, Nickel, fluorine and zinc. In addition, this fish contains large amounts of vitamins B1 and B2. Therefore, the meat of the coho stimulates growth in children, improves the condition of skin and hair, has beneficial effect on the heart, promotes the production of hemoglobin, strengthen bones and improve mental performance and improves mood and raises vitality. - salt, pepper to taste. A cleaned and gutted kiguchi with separated fins and gills to make cuts. To cover the carcass of the fish with salt and pepper, stuff the inside with lemon and Bay leaves, then fill the cuts with slices of lemon and tomato. Then coat fish with sour cream and wrap in foil. Prepared the coho put on a baking tray and a knife or toothpick small holes in the foil. After that put everything in a preheated 160оС the oven and bake for roughly 40 minutes, depending on fish size. Coho is ready to take out, cut into pieces or serve right in the foil, sprinkled, if desired, fresh herbs.